Valerian root has been traditionally used as a sleep aid and as a natural and healthy alternative to sleeping pills. In my experience it can help with insomnia, it can calm anxiety and stop heart palpitations. The root of the valerian plant (valeriana officinalis) has sedative properties and can help with both: getting to sleep quicker and improving the quality of sleep. The effectiveness of valerian as a sleep aid has been reported to grow with continued use. Valerian does not have the dangers of dependency or rebound restlessness associated with it, as do some other sleep aids. 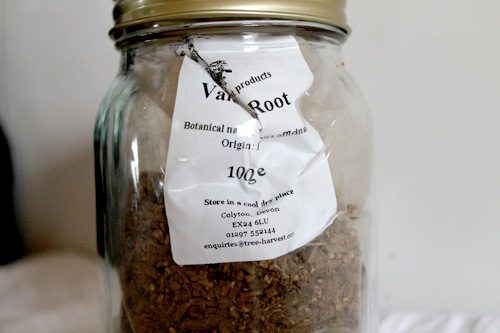 Valerian root in dried herb form is best stored away in a glass container, to prevent the strong smell from escaping. Valerian has also been used to help with mild tremors, psychological stress, nervous asthma, chronic fatigue syndrome, hot flashes, menopause, dysmenorrhea (painful menstruation), rheumatic pain, emotional stress, exhaustion, general stress, etc. According to the Savvy Teas and Herbs -website, valerian root is also very effective in treating heart palpitations. They explain that a combination of hot valerian and cayenne pepper has been used by some to treat hysteria, convulsions and colic. The same website also points out that from a nutritional point of view, valerian is a good source of calcium and magnesium. Valerian has also been used to treat nervous system disorders. It contains 'valerenic acids', which may in the body transform into GABA. The latter is an amino acid which, in turn, promotes relaxation, lowers stress levels, improves moods and tranquillizes the nervous system. Valerian can fight nervousness, nervous excitability, lower heart rate and relieve hypertension (high blood pressure). Its nervous system tranquillizing properties can also help for panic attacks and even depression in some. It is also said to help to relax tense muscles via its effect on the autonomic nervous system. In my personal experience valerian worked quite quickly to calm anxiety, to lessen anxiety-related heart palpitations, and to help me fall asleep. But I have heard warnings that using the herb long-term may be damaging to the liver and thus I only use it occasionally. Taken in reasonable quantities, valerian can be used for mild anxiety relief during the day as well since it doesn't induce continual drowsiness or sleepiness during the day, as many drugs would. "When air-raids were a serious strain on the overwrought nerves of civilian men and women, valerian, prescribed with other simple ingredients, taken in a single dose, or repeated according to the need, proved wonderfully efficacious, preventing or minimizing serious results." Johann Künzle, a famous herbalist of the 19th Century (born in 1857), developed a series of teas which are still sold under the Swiss company, Kräuterpfarrer Künzle AG. The original source of this information regarding the valerian teas for mood and tension, as well as various other teas developed by Künzle is: www.itmonline.org. I would recommend that you research each of these herbs separately before making your teas, because if you want it to have medicinal and healing effects, you will need to ensure the correct dosages of each carefully. Valerian root can be taken as tea, tincture, capsules or tablets. Some reports state that continuous use of two weeks is required before the positive effects of valerian root can be felt. Others state that it works straight away. 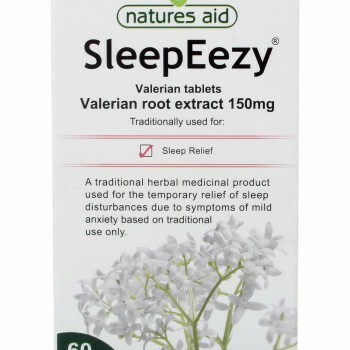 The recommended dosage on the label of Nature's Aid SleepEezy valerian root extract is 1-2 capsules an hour before bedtime for adults. Each capsule has 150mg of the extract, which according to the company is equivalent to 750mg-900mg of the actual root. Two capsules effectively helped me to relax and sleep when I was feeling anxious, and 5ml of the tincture as shown below was almost equally effective. Keep in mind that valerian has a very strong smell and taste so if you are sensitive to strong tastes and smells, you may prefer to take the capsule instead of the herb or the tincture. According to the Institute for Traditional Medicine (www.itmonline.org) based in Portland, Oregon, the dosage of valerian root required for the mildly sedative and mildly antispasmodic effects is 2-3 grams. 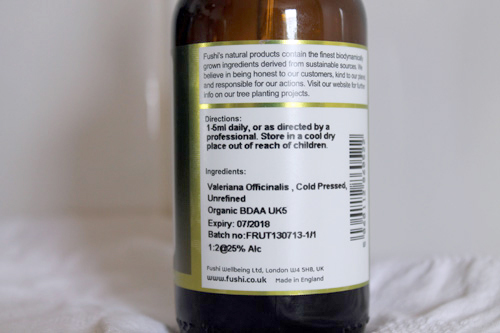 This cold-pressed, organic valerian alcohol tincture label recommends a dosage of 1-5ml daily of 1:2 tincture @ 25% alcohol. According to 'Savvy Teas and Herbs' (www.savvyteasandherbs.com) Valerian Root should never be boiled because much of its therapeutic value is in the essential oils. They recommend that the best form to take it is in a tincture. If you want to use this and/or related herbs in decoctions, i.e. larger therapeutic quantities, you will have to seek the advice of a Traditional Chinese Doctor or another Master Herbalist, who will be able to thoroughly diagnose you and prepare a herbal mixture with herbs that balance each other's qualities. "Besides being effective, valerian root has been shown to be safe. The American Herbal Products Association has given valerian a class 1 safety warning, which means that it is a safe herb with a large dose range. Even though it is safe, some people experience unpleasant side effects such as nervousness, restlessness, anxiety, and heart palpitations." - Source: Naturalnews.com explains that valerian is an effective sleep aid. However, other reports state that the general calming effect of valerian root can be too much for some people and cause depression. Valerian is a relaxant, and therefore can also be labelled 'a downer' drug. With valerian, as generally with any supplement or herb, it is best to ensure a high-quality source to avoid any possible contaminants and toxins that may be present in the cheaper and lower quality supplements and herbs. Your typical supermarket is likely not going to be the best supplier of supplements. Many, though not all, health food stores carry higher-quality organic herbal supplements but even then check the labels and discuss the product with the staff. Larger doses of valerian can leave you groggy in the morning. Too large doses of valerian in general have been associated with different negative effects. Some people are allergic to valerian and have reported skin rashes and breathing problems. Same restrictions as with other sedatives apply: Valerian should not be taken when driving or performing tasks that require good motor skills or fast reflexes. It should not be combined with other sedative, sleep-aid or anti-depressant medication. Some reported withdrawal symptoms after long-term use of valerian have included heart problems and delirium. It may also cause damage to the liver and a nutritionist I consulted with warned against long-term use for this reason. It is also not recommended for pregnant or nursing women or for those with a compromised liver. A strange reported side effect of valerian use by some is more vivid dreams. The Institute of Traditional Medicine in Portland, Oregon, reports that valerian may increase the effects of certain anti-seizure medications or prolong the effects of certain anaesthetic agents. There are numerous species of valerian - approximately 150 different species worldwide, of which 20% have been recorded as used for medicinal purposes. Valerian officinalis, or 'official valerian' is the most commonly used by herbalists. The name of the plant is believed to originate from Latin 'valere' = 'to be in health' or 'valero' = 'strong'. Other herbs that may help with insomnia and make you sleep better are: kava kava, hops, passion flower, lemon balm and catnip. Also, a good quality angelica essential oil (two drops on forehead) can help you sleep better. (The organic ranges are normally stronger and more effective.) In addition, transdermal magnesium oil has a very fast effect on relaxation and provides better sleep. You can also add a large glass of magnesium flakes in your bath for relaxation, although the effect, in my experience, is less intense than that of magnesium oil's. I have also noticed that both rhodiola rosea and GABA help with anxiety to some degree. For natural pain-killer effects, look to grounding, eating lots of fruit and deep breathing. Detoxification and strengthening of the body by nutritional means can in general provide longer-term help for pain issues. Also, I have heard that large doses of Vitamin D can work as a pain killer, but research these topics further before trying them yourself. In conclusion, valerian is an effective sleep aid and can ease mild anxiety and heart palpitations, as well as induce general calmness. I don't seem to suffer from drowsiness in the mornings from using it - not too badly anyway. I also noticed some pain-relieving effects but quite mild.